The Smart TV Game Has Changed. Built on the industry’s most chosen OTT enabling technology – Vewd Core – Vewd OS elevates the smart TV experience to bring everyone a better way of watching what they love with simple yet powerful viewing features. From cohesive integration of content from multiple sources to cloud-based app access, Vewd OS changes the way users watch TV forever. The consumer smart device experience has finally been elevated. Beginning with a cinematic home screen, Vewd OS immerses the viewer in video. Static apps icons give way to dynamic thumbnails giving users a real-time review of content. Boundaries are a thing of the past. Activated by remote control or voice, The Vewd Program Guide seamlessly integrates live TV, native internet content and on-demand video allowing users to time-shift and watch previously aired content. The painful process of downloading and updating an app is over. Vewd OS is stocked with thousands of apps managed by Vewd and accessed from Vewd Cloud. Not only are there no downloads, there’s no need to update an app ever again. Breakthrough personalization features allow viewers to favorite nearly everything from apps to video. Designed to navigate and launch video in the shortest time possible via either remote or voice control. 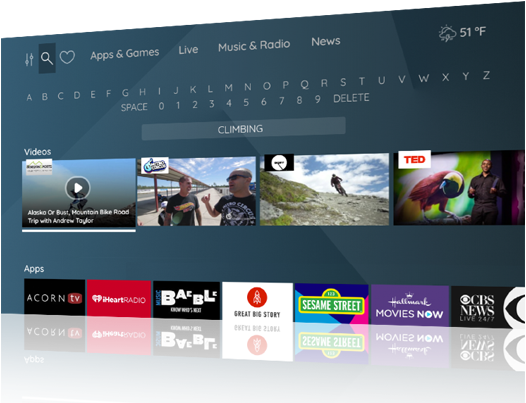 Vewd OS brings it all together to help find what to watch next – faster. Today, most independent smart TV operating systems allow their makers to capture all the value – not manufacturers. Vewd OS changes this power dynamic by bringing all of the features manufacturers want and need, while adding new capabilities through the Vewd Cloud. Whether you want a complete turnkey solution, or prefer to mix-and-match from a combination of Vewd’s world-class products and modules, it’s never been easier or more flexible to build a differentiated and modern Smart TV experience. Gain insights into how viewers interact not only with the product, but also with the apps and content available through Vewd OS. Those analytics can then be used to further test, refine and deploy new user experiences on devices. An easy-to-use toolkit allows comprehensive alterations to the look, feel and branding to make every device portfolio distinct and unique. The story doesn’t have to end once the TV is sold. Vewd OS lets manufacturers share revenue after the sale, tapping into significant recurring revenue opportunities. 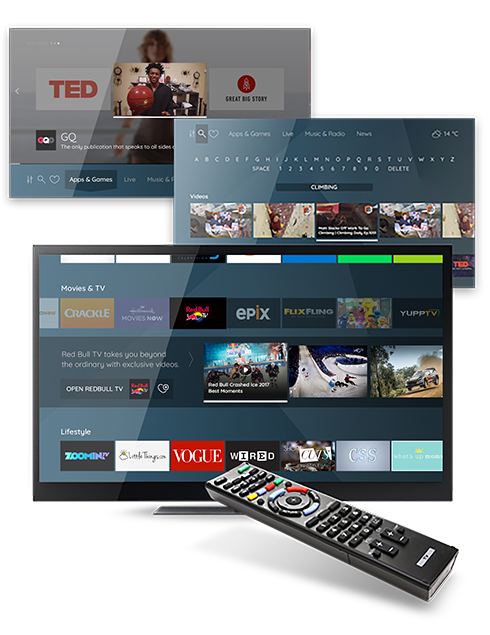 Vewd OS is richly outfitted with standard software features for smart TVs, such as a media player, device settings, and many more – all managed from the Vewd Cloud. The Vewd Cloud also includes privacy controls (with GDPR support), ad management, billing, and audience promotion tools, making Vewd OS the perfect mix of software and cloud services. 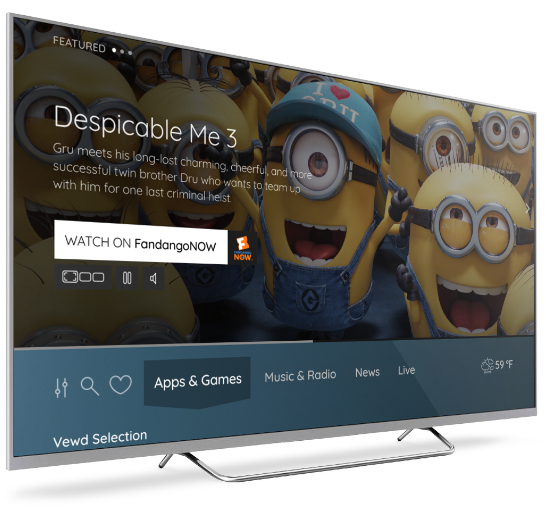 Vewd OS is currently optimized across dozens of major smart TV semiconductor platforms. This ensures a readily-available, high-performance software solution on the manufacturer’s chosen semiconductor platform, significantly reducing investment costs and the timeline for bringing devices to market. Attract new viewers, strengthen engagement and improve monetization. Vewd OS helps content owners grow and unlock new opportunities. Drive traffic and increase viewers with the help of the industry’s most comprehensive promotional toolkit for video. Vewd OS maximizes the screen real estate for video, and provides more opportunities to discover your next viewer. Vewd OS directly integrates billing, simplifying collection for content owners pursuing subscription or transaction business models. Monetization of OTT content doesn’t have to be a burden. Easily earn money from content by displaying pre-, mid- and post-roll advertisements within your TV app, using an existing or Vewd’s advertising solution.